Hyperimmunoglobulinemia D/periodic fever syndrome is caused by recessively inherited mutations in the mevalonate kinase gene and is characterized by persistently high polyclonal serum IgD titre and recurrent febrile attacks. No conventional therapy exists for preventing the typical recurrent inflammatory picture of patients. A host of studies have evidenced that elevated levels of various cytokines, such as interleukin-1 (IL-1), mark febrile attacks in this disease and that IL-1 might represent a suitable therapeutic target. 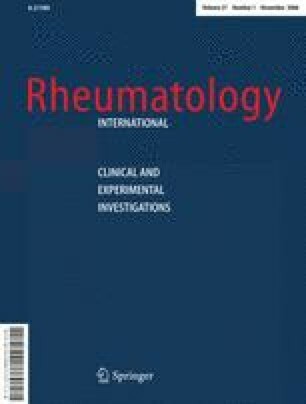 We describe the case of a 7-year-old female-child with an established diagnosis of hyperimmunoglobulinemia D/periodic fever syndrome in whom anakinra, IL-1 receptor antagonist, was daily administered at the dosage of 1 mg/kg/day by subcutaneous injection for 18 months after numerous disappointing attempts with non-steroidal anti-inflammatory drugs, steroids, colchicine and etanercept through the years. The clinical response under anakinra treatment was recorded through a standardized diary, whilst inflammation parameters were serially measured in comparison with the half-year before starting anakinra. Frequency and severity of fever attacks were totally reduced by anakinra and this is the first child demonstrating that symptoms of hyperimmunoglobulinemia D/periodic fever syndrome might be at least extenuated by anakinra, though not abolished. We thank Miriam Del Prete for her technical support in the manuscript preparation and the whole Department “Pediatria 2” of our University where the reported child has been so far hospitalized.